In 2017, Lyle Courtice of HarkAway Botanicals, in association with Concept Plants B.V. will release their latest introduction into the horticultural trade. Hakonechloa macra SunFlareTM is the first-ever international new plant introduction being offered in Europe and many countries including Japan, Australia, New Zealand, UK, Canada, the United States, South Korea and China. Starting in the spring of 2017, SunFlareTM will be available to wholesale growers across Canada the United States and Europe, with production ramping up in 2016 to meet the already growing interest and demand. Gardeners should see plants available at retail shops in the latter part of 2017. 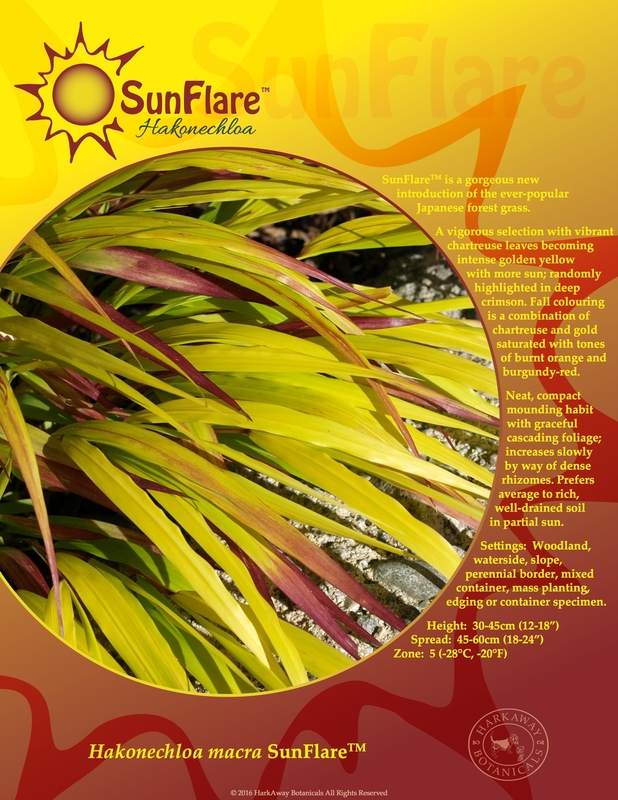 SunFlareTM Japanese forest grass is a beautiful new introduction and represents an important Canadian contribution to temperate gardens everywhere. This stunning form of Hakonechloa macra is a sport selected from the popular cultivar ‘All Gold’ and boasts vibrant chartreuse leaves that with more sun become intense golden yellow, randomly highlighted in deep crimson. Fall colouring is a combination of chartreuse and gold saturated with tones of burnt orange and burgundy-red. This neat, strong-growing grass has a compact habit and forms an upright mound with graceful cascading foliage. Plants reach 30-45cm (12-18″) in height with a spread of 45-60cm (18-24″) in 3-5 years and can be grown in a wide range of climates with a solid hardiness rating of Zone 5 (-28oC, -20oF). SunFlareTM Hakonechloa grows well on most sites with average to rich, well-drained soil. Suggested settings include woodland, waterside, slope, perennial border, mixed container, mass planting, edging and container specimen. The striking colour combinations are sure to make an impact in any garden setting.